Life Systems provides Chiropractic EHR/EMR software since 1992. Check our pricing specials and call our sales representative to get started. 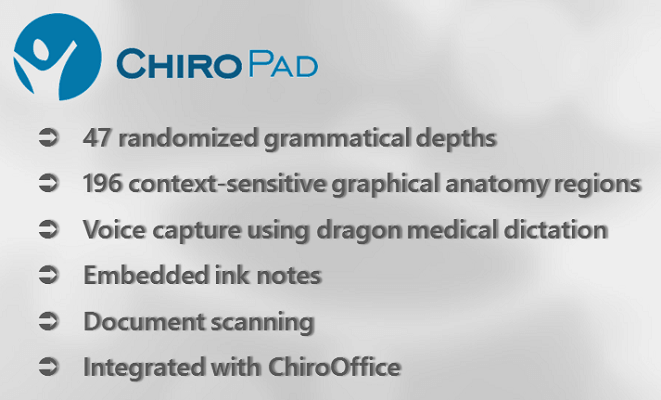 Chiropad EMR is a Chiropractic SOAP notes software that generate dictation quality notes. Random text generation with 47 randomized grammatical depths means that every report has a dictated and unique feel to it. 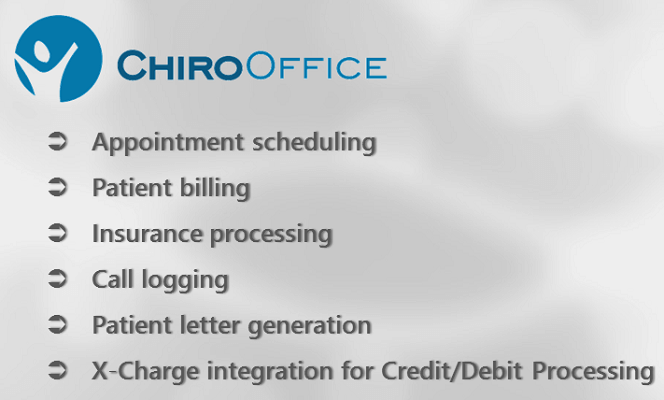 ChiroOffice is a backoffice EHR software to automate and streamline appointment scheduling, patient billing, fee scheduling, insurance processing, call logging, patient letter generation, document scanning, project management, and more, all in one integrated application. 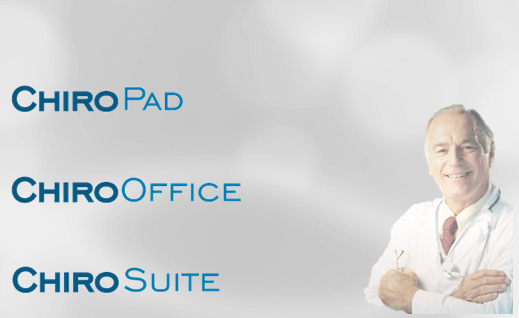 ChiroSuite combines the power of ChiroOffice and flexibility of ChiroPad into one integrated Suite to provide a complete solution for your practice. Today's chiropractic offices are busier and more paperwork-laden than ever. However, the potential for real savings in time and money exists with the right software. When you're ready to escape the clutter and concentrate on your specialty, ChiroSuite EHR software is your complete solution. Produced by Life Systems Software, ChiroOffice, and ChiroPad EMR have changed the way many chiropractors do business. ChiroSuite EHRrepresents the very latest innovations in healthcare management and EMR SOAP notes software. With over a decade in the business of streamlining healthcare procedures, Life Systems Software now offers the simplest, most comprehensive solution for saving staff time--as well as your own. Read our many testimonials from professional DCs around the country and you'll be amazed to discover the potential savings to your practice's bottom line with the use of ChiroSuite EHR. ChiroOffice allows your staff to manage appointment scheduling, patient billing, insurance processing, phone-call logging, project management and much more. ChiroOffice is designed as a workhorse, geared for multi-doctor, multi-disciplinary, and even multi-clinic applications. ChiroPad EMR works as your own personal assistant in the exam room, letting you enter your notes instantly and with exceptional clarity. The random text generation features 47 randomized grammatical depths that give your documentation a dictated appearance. One user of the ChiroSuite EHR software estimates that his staff saves one to three hours per day in office management time. Another user says that the vast reduction of rejected claims saves his practice thousands of dollars per year. Take a virtual tour of ChiroOffice and ChiroPad EMR today and see how Life Systems Software is revolutionizing the healthcare business.